Why are Malay weddings always held at the void deck? Why are Malay weddings so noisy? Are Malay weddings really $50? Click here to see the full FAQs but for convenience the answers for the last three questions are below. I love it that it is written in a light-hearted manner and not casting any aspersions on anyone. It is also very educational. Hopefully we can take a lighter approach to things (you know what I mean). For the record, I love the answer on “Why are Malay weddings so noisy”? 13. Why are Malay weddings always held at the void deck? Back during the kampung days, where there were open spaces at the vicinity of one’s home, the wedding would be held right there. Malay families are large, which is why invitations may be extended up to 2000 people. We don’t stop definition of family at being blood related; close friends and in-laws are family to us too, and all the more they should come and celebrate the joyous occasion. Thus, a void deck would be the best amount of space to accommodate such a large group of people. 14. Why are Malay weddings so noisy? It’s a party, you wouldn’t want to attend a gloomy party would you? Usually it’s the karaoke activities that reaches out our ears, maybe up to 500m away, and gets on our nerves (especially if someone is butchering Mariah Carey’s Without You). While Malays love to sing, not all of us are blessed with a wonderful voice, so yes, the noise may disturb others for a bit, but we’re at 7,257 people per sq km (I Googled that, really, here it is), some tolerance is required. 15. Are Malay weddings really $50? Haha, no! Even if one didn’t have a wedding party, and just got solemnised at ROMM (Registry of Muslim Marriages), they would need more than $50. The maskahwin, which is a compulsory requirement to get married is already $100, so even if everything else, like fees to the kadi (solemniser), transportation to ROM, something nice to wear, was totally free, it’s definitely more than $50. Here, check this link out, for a definition of maskahwin and general information of marriage expenses. What I really wish for Amy Cheong and all of us. Wow. That was one big day for Amy Cheong, NTUC, the singapore political community, the Malay community and the Singaporean citizens and residents as a whole. It’ll die down as time lapses and new issues come up. 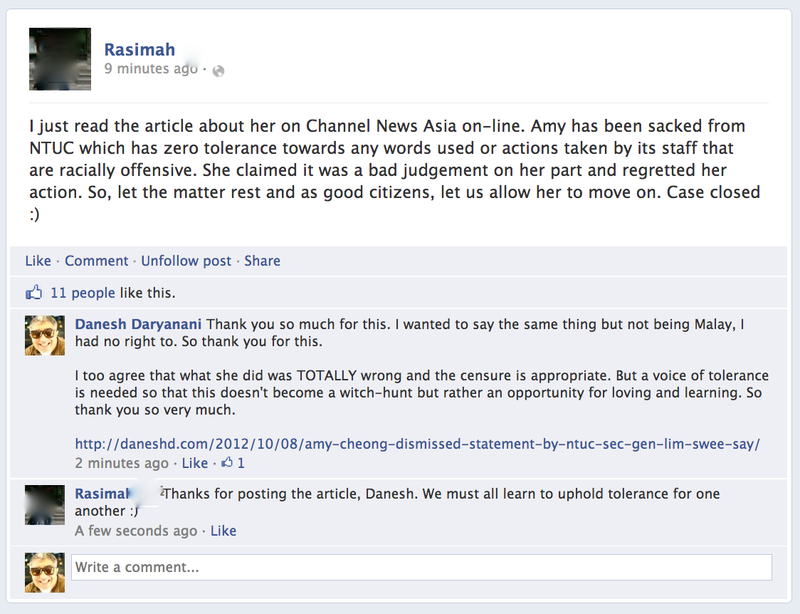 I pray that Amy Cheong has learned her lesson; but the right one. The lesson is not merely about being careful about what we post online, privacy settings and ranting but lessons rather on understanding, tolerance, harmony and demonstrating love. That’s what I hope she is learning. For the rest of us, I pray we learn to forgive. Forgiveness does not mean I need to accept what she has done. Forgiveness is not condoning her action. Forgiving is giving her a chance in spite of what she has done. Forgiveness is also about hope. NTUC fired her. And I believe what they did is absolutely right. It is a fair response to what she said on her Facebook page. But eventually, she will be re-hired. I hope that we do not condemn the company that eventually hires her. And I hope she does not abuse that hope that we will put in her. I hope she has learned and will use this to be more tolerant and teach others to be the same way. Yes, I roundly condemn her actions. But I choose to hope. In a statement sent to the media, its secretary-general Lim Swee Say said the trade organisation has “terminated with immediate effect” the services of Ms Amy Cheong, Assistant Director, Membership department after establishing with her that she did post offensive comments… on 7 October 2012″. “Regrettably and rightly so, her comments have upset members of the public, including many union members. We are sorry that this has happened. We have counselled the staff and impressed upon her the seriousness of her action. She is remorseful and has apologised for her grave lapse of judgement,” he added. He also reiterated in his statement that the NTUC “takes a serious view on racial harmony in Singapore”, adding that it “will not accept and have zero tolerance towards any words used or actions taken by (its) staff that are racially offensive”. Now, what can we learn from this and continue to educate that Love is the answer?